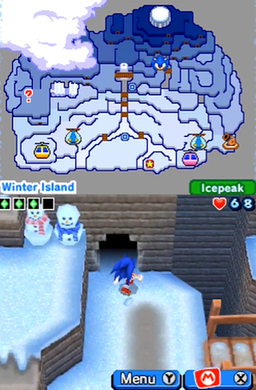 Icepeak is a town found in Mario & Sonic at the Olympic Winter Games, and home of the Snow Spirit Icy. It is the fifth town in Adventure Tours, and, as the name implies, is a mountain peak with various platforms, and cliffs that cause Mario and Sonic the Hedgehog to slide down levels in the mountain. The place also features many Warp Pipes that take the player to underground chambers. One such chamber actually contains a sleeping Dark Chao, who will feel annoyed if awakened by talking to him. Toad theorizes that those chambers are where people go to sleep after the Olympic events are over. Should the heroes try talking to the Dark Chao again, Amy Rose will say they should just walk out silently and leave him be, as a way to apologize, an idea soon supported after they hear the Dark Chao mumbling asleep about them. An area of Icepeak also has a mission hosted by a Lakitu, which can only be taken by Princess Daisy. Should she complete it, along with another mission in Blizland (from the same Lakitu), he'll then award them with the Meteor Curling Stone, required for playing Dream Curling missions. The snow spirit Blizza is kept hostage in a cage here. While Blizza is successfully freed after Rouge the Bat is defeated in Figure Skating, Bowser and Dr. Eggman then immediately kidnap Frosty and take him to Blizland. Icepeak was named for its cold, wintry mountain peak. Little is known about where the Chao live, or where they come from. Donkey Kong is often helped by his Animal Buddies. Blaze the Cat came to this world using the power of the Sol Emeralds. In Icepeak there's a cliff that is too slippery to climb. Princess Daisy was kidnapped by a bad guy called Tatanga, but Mario rescued her. Wario is the president of WarioWare, Inc. and is very focused on making money. If Mario just met Wario and Waluigi at Icepeak before Polastraits, they seem disappointed that he ignores them while they're at Polastraits.